01 7 Minutes of nausea – How forgotten are the anonymous dead? I got this impressive package from Matjaz from SIST EN 343 and it took me a while to finally listen to this three way split between 7 minutes of nausea, SIST EN 343 and tn666. Inside it are four tracks by these artists, with the common toxic ground of being hostile to the extreme. It’s not surprising at all if you’re familiar with the work of these people, yet put together, they manage to raise this kind of dormant awareness about their intensity as their tracks weld together this harsh, nauseating creation. 7MON starts this assault by a beautifully distorted composition that juggles between the great speech and drum work, who together tempt the listener to concentrate as much as possible on what’s happening on this track, and the insane rumbling and almost (but not!) random breaks, that challenge the mental endurance of the ears. 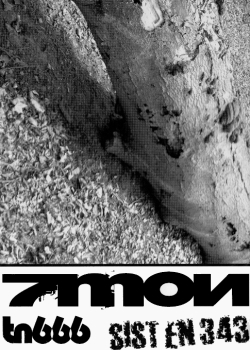 Demanding and unforgiving, 7MON gives an excellent opening to this album, proving they should not be forgotten or anonymous. But the category of being unforgiving definitely belongs to SIST EN 343. Z8-36L begins with a slow electronic breathing that crawls out of the abyss in order to evolve into a fully blown apart wall of harsh noise and quirky glitches. There is a language there, trying to communicate above or below the raging distortions, and whenever you think you understands what the message is, it slips away and drown in the harsh noise, only to surface again minutes later and test you again. tn666 closes the album with two tracks that move on the edgy, sharp line of piercing noise, with spacey occurrences and anomalies that result in tracks that are even more alien than they are hostile. tn666 brings wonderful, mind melting surprises to their annihilating Euphonium and shows it has many things to say even after I was awe struck by the other two projects. Not an easy album in any way, this split shows different approaches and interesting angles to the term “noise”. Some say that anyone can make noise, but you can easily hear that these guys also know what they are doing, and together they form a well packed 69 minutes of forced nausea. And it’s delightful.